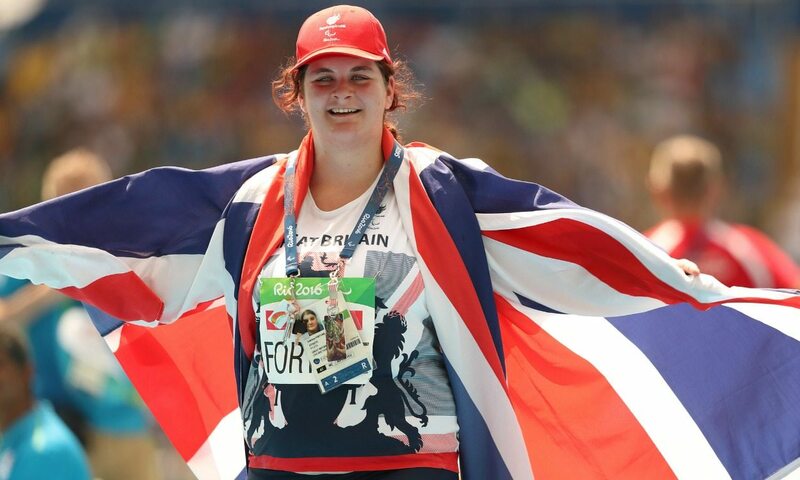 Sabrina Fortune took the British athletics team’s medal haul to eight on the third morning of competition at the Rio Paralympic Games. Throwing a personal best of 12.94m in the F20 shot put, the world and European fourth-placer went one better to claim her first global medal in a competition won by Poland’s Ewa Durska with a world record of 13.94m. “To get a medal and a PB is just unbelievable,” said the 19-year-old, who had gone into the competition with a lifetime best of 12.76m from earlier this summer. “It is such an honour to represent my country at these Games. Fortune had been in bronze medal position from the first round as she opened with a 12.33m effort, but she saved her best until last to consolidate that place. Durska improved her own world record in the fifth round, while Ukraine’s Anastasiia Mysnyk secured silver with a 13.24m PB. To the delight of the home crowd, Petrucio Ferreira dos Santos ran a T47 100m world record of 10.67 in the heats to secure his spot in Sunday’s final. Another world record was broken by Ukarine’s Leilia Adzhametova in the first round of the T13 100m as she clocked 11.86 to storm into the final. A short while earlier South Africa’s Charl du Toit had broken the T37 100m world record also in his heat as he ran 11.42 in a race which saw GB’s Rhys Jones finish fourth in a PB of 11.77 to make the final. Jones’ team-mate Sammi Kinghorn also progressed in the T53 400m after finishing fourth in 56.76 but advancing from her heat as a fastest loser. On making the final, Kinghorn said: “That is what I came to do, so I’m more than happy now to be safely through to the final. Claudiney Batista dos Santos was another to enjoy success on home soil as the London 2012 javelin silver medallist threw a Paralympic record of 45.33m to win the F56 discus title. China’s Yang Liwan threw a Paralympic record 7.89m to win F54 shot put gold but that mark was agonisingly just a single centimetre off her own world record set in April. Canada’s Michelle Stilwell was another Paralympic record-breaker as she clocked 1:05.43 for T52 400m gold, while Somaya Bousaid led a Tunisian 1-2 in the T13 1500m final, running a 4:21.45 PB to Najah Chouaya’s 4:30.52. US athletes claimed the top two spots in the men’s T52 100m final as Gianfranco Iannotta clocked 17.17 to take the title ahead of world record-holder Raymond Martin with 17.25, while victory in the T12 long jump went to South Africa’s Hilton Langenhoven, who adds Rio gold to his pentathlon, 200m and long jump titles from Beijing 2008 after his winning leap of 7.07m. Full results can be found here. GB’s Hannah Cockroft, Graeme Ballard, Richard Whitehead and Dave Henson are among athletes in action during Saturday’s evening session.